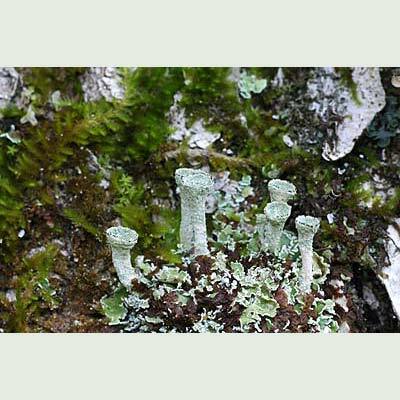 As its name implies, this is the classic ‘pixie cup’ lichen complete with golf-tee credentials. It is distinguished from its two closest relatives by careful attention to the surface of the stalk and cups which in this species are covered with rough warts and granules. There are no powdery or finely granular soredia to be seen. This scaly lichen also inhabits a different habitat to its lookalikes preferring dry banks, walls and rocks and sometimes basic-barked trees. Occasionally brown discs can be found on the rims of the cups. Dry walls, banks, rocks and trees, never rotting tree stumps or on peaty ground. Simms, M. J., (2016). Cladonia pyxidata (L.) Hoffm.. [In] LichenIreland.